Unripe, nutritionally rich bananas that are 5 - 6 inches long and about 1 inch in diameter when peeled. Green Bananas are not to be confused with plantains. Unripe, nutritionally rich bananas that are 5 - 6 inches long and about 1 inch in diameter when peeled. Green bananas are elliptically shaped fruits "prepackaged" by Nature, featuring a firm, creamy flesh gift-wrapped inside a thick inedible peel. Choosing: Look for bright green color with no bruising or spots on the skin, they should be firm but not too hard. Buying: You can purchase at your local grocery store or at your local farmers market. You can use in salads, fruit salads, fruit cups, pancakes, or dry them in food dehydrator. Cleaning: You can rinse the green banana with cold running water prior to peeling. 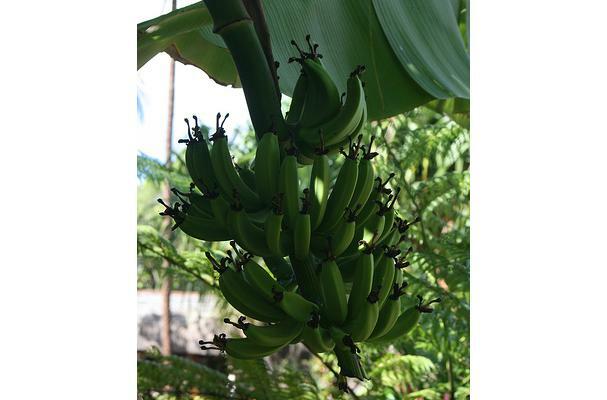 Green bananas should ripen at room temperature and should not be subjected to overly hot or cool temperatures. Unripe bananas should not be placed in the refrigerator because this will interrupt the ripening process to such an extent that it will not be able to resume even if the bananas are returned to room temperature. If you need to hasten the ripening process, you can place bananas in a paper bag or wrap them in newspaper, adding an apple to accelerate the process. History: Its said that bananas are thought to have originated in Malaysia around 4,000 years ago. From there, they spread throughout the Philippines and India, where in 327 B.C. Alexander the Great's army recorded them being grown.